I just spent the last week back out on the road again and I’m sad to report that in a lot of ways I felt more at home out traveling than I do back in Fresno. Granted I haven’t lived in Fresno since I graduate high school back in the day and traveling is still fresh in the brainscape but I was still a little surprised. 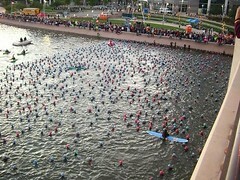 After the haunted house experience I hightailed it to Tempe, AZ to watch Katy compete in her second Ironman. And like a sucker, I believed them. As a result here I am at 27 and I still don’t take many activities seriously. I think, “Well, if it’s possible then why WOULDN’T I be able to do it? Let’s go!” Some things obviously take more work than others but to this day I feel as though if I’m willing to put the work in then I can make it happen. Period. Even after watching 2200 people take on Ironman Arizona and seeing over 2000 of them actually finish (including Katy)…I don’t think I could do it. You have no idea how much it kills me to see that in writing. It’s almost enough to make me give it a try anyway. And maybe I COULD technically do it…eventually. But…I don’t want to drown. After 2.4 miles of swimming, 112 miles of biking and 26.2 miles of running Katy crossed the finish line exactly 12 hours and 15 minutes after the starting gun fired. So glad I saw it all happen. Never in my life have I seen so many people so determined to do what their bodies are screaming at them to stop doing. 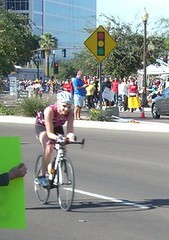 For a more first hand account you should check out Katy’s blog at http://ironkatyinaz.blogspot.com/. She writes JUST like she talks so it’s a fun read.